"Dayton" redirects here. For the Dayton metropolitan area, see Greater Dayton. For other uses, see other uses (disambiguation). Location in Montgomery County and the state of Ohio. 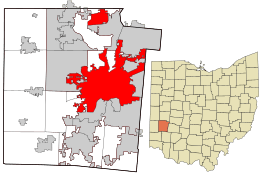 Dayton (/ˈdeɪtən/; local pronunciation: /ˈdeɪʔn/) is the sixth-largest city in the U.S. state of Ohio and is the county seat of Montgomery County. A small portion of the city extends into Greene County. In the 2010 census, the population was 141,527, and the Dayton metropolitan area had 799,232 residents, making it Ohio's fourth-largest metropolitan area, after Cleveland, Cincinnati, and Columbus and the 63rd-largest in the United States. The Dayton-Springfield-Greenville Combined Statistical Area had a population of 1,080,044 in 2010, making it the 43rd-largest in the United States. Dayton is within Ohio's Miami Valley region, just north of the Cincinnati–Northern Kentucky metropolitan area. Ohio's borders are within 500 miles (800 km) of roughly 60 percent of the country's population and manufacturing infrastructure, making the Dayton area a logistical centroid for manufacturers, suppliers, and shippers. Dayton also hosts significant research and development in fields like industrial, aeronautical, and astronautical engineering that have led to many technological innovations. Much of this innovation is due in part to Wright-Patterson Air Force Base and its place within the community. With the decline of heavy manufacturing, Dayton's businesses have diversified into a service economy that includes insurance and legal sectors as well as healthcare and government sectors. Other than defense and aerospace, healthcare accounts for much of the Dayton area's economy. Hospitals in the Greater Dayton area have an estimated combined employment of nearly 32,000 and a yearly economic impact of $6.8 billion. It is estimated that Premier Health Partners, a hospital network, contributes more than $2 billion a year to the region through operating, employment, and capital expenditures. 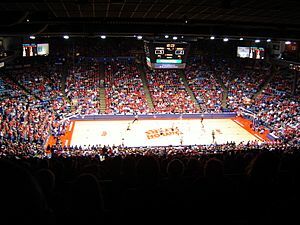 In 2011, Dayton was rated the No. 3 city in the nation out of the top 50 cities in the United States by HealthGrades for excellence in health care. Many hospitals in the Dayton area are consistently ranked by Forbes, U.S. News & World Report, and HealthGrades for clinical excellence. 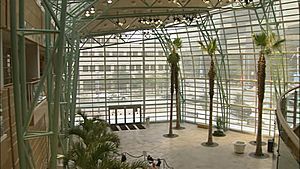 Dayton is also noted for its association with aviation; the city is home to the National Museum of the United States Air Force and is the birthplace of Orville Wright. Other well-known individuals born in the city include poet Paul Laurence Dunbar and entrepreneur John H. Patterson. Dayton is also known for its many patents, inventions, and inventors that have come from the area, most notably the Wright brothers' invention of powered flight. In 2008, 2009, and 2010, Site Selection magazine ranked Dayton the No. 1 mid-sized metropolitan area in the nation for economic development. 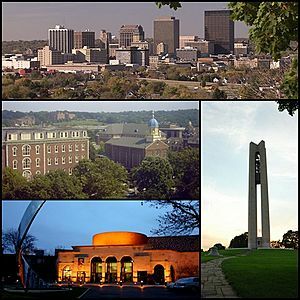 Also in 2010, Dayton was named one of the best places in the United States for college graduates to find a job. Dayton was founded on April 1, 1796, by 12 settlers known as "The Thompson Party." They traveled in March from Cincinnati up the Great Miami River by pirogue and landed at what is now St. Clair Street, where they found two small camps of Native Americans. Among them was Benjamin Van Cleve, whose memoirs provide insights into the Ohio Valley's history. Two other groups traveling overland arrived several days later. Historically, Dayton has been the home for many patents and inventions since the 1870s. According to the National Park Service, citing information from the U.S. Patent Office, Dayton had granted more patents per capita than any other U.S. city in 1890 and ranked fifth in the nation as early as 1870. The Wright brothers, inventors of the airplane, and Charles F. Kettering, world-renowned for his numerous inventions, hailed from Dayton. The city was also home to James Ritty's "Incorruptible Cashier", the first mechanical cash register, and Arthur E. Morgan's "hydraulic jump", a flood prevention mechanism that helped pioneer modern-day hydraulic engineering. Paul Laurence Dunbar – a famous African-American poet and novelist – penned his most famous works in the late 19th century and became an integral part of the city's history. Innovation led to business growth in the region. In 1884, John Henry Patterson acquired James Ritty's National Manufacturing Company along with his cash register patents and formed the National Cash Register Company (NCR). The company manufactured the first mechanical cash registers and played a crucial role in the shaping of Dayton's reputation as an epicenter for manufacturing in the early 1900s. In 1906, Charles F. Kettering, a leading engineer at the company, helped develop the first electric cash register, which propelled NCR into the national spotlight. NCR also helped develop the US Navy bombe, a code-breaking machine that helped crack the Enigma machine cipher during World War II. A catastrophic flood in March 1913, known as the Great Dayton Flood, led to the creation of the Miami Conservancy District, a series of dams and hydraulic jumps installed around Dayton, in 1914. Like other cities across the country, Dayton was heavily involved in the war effort during World War II. Several locations around the city hosted the Dayton Project, a branch of the larger Manhattan Project, to develop polonium triggers used in early atomic bombs. The war efforts led to a manufacturing boom throughout the city, including high demand for housing and other services. At one point, emergency housing was put into place due to a housing shortage in the region, much of which is still in use today. Between the 1940s and the 1970s, the city saw significant growth in suburban areas from population migration. Veterans were returning from military service in large numbers seeking industrial and manufacturing jobs, a part of the local industry that was expanding rapidly. Advancements in architecture also contributed to the suburban boom. New, modernized shopping centers and the Interstate Highway System allowed workers to commute greater distances and families to live further from the downtown area. More than 127,000 homes were built in Montgomery County alone during the 1950s. Since the 1980s, however, Dayton's population has declined, mainly due to the loss of manufacturing jobs and decentralization of metropolitan areas, as well as the national housing crisis that began in 2008. While much of the state has suffered for similar reasons, the impact on Dayton has been greater than most. Dayton had the third-greatest percentage loss of population in the state since the 1980s, behind only Cleveland and Youngstown. Despite this, Dayton has begun diversifying its workforce from manufacturing into other growing sectors such as healthcare and education. Downtown expansion that began in the 2000s has helped revitalize the city and encourage growth. Fifth Third Field, home of the Dayton Dragons, was built in 2000. The highly successful minor league baseball team has been an integral part of Dayton's culture. In 2001, the city's public park system, Five Rivers MetroParks, built an outdoor entertainment venue known as RiverScape MetroPark that attracts more than 400,000 visitors each year. A new performance arts theater, the Schuster Center, opened in 2003. A large health network in the region, Premier Health Partners, expanded its Miami Valley Hospital with a 12-story tower addition. In 1995, the Dayton Agreement, a peace accord between the parties to the hostilities of the conflict in Bosnia-Herzegovina and the former Yugoslavia, was negotiated at Wright-Patterson Air Force Base, near Fairborn, Ohio, from November 1 – 21. In a small bend of the Great Miami River, with canals on the east and south, it can be fairly said, without infringing on the rights of others, that Dayton is the gem of all our interior towns. It possesses wealth, refinement, enterprise, and a beautiful country, beautifully developed. Dayton also plays a role in a nickname given to the state of Ohio: "Birthplace of Aviation". Dayton is the hometown of the Wright brothers, aviation pioneers who are credited with inventing and building the world's first successful airplane. After their first manned flights in Kitty Hawk, North Carolina, which they had chosen due to its ideal weather and climate conditions, the Wrights returned to Dayton and continued testing at nearby Huffman Prairie. Additionally, Dayton is colloquially referred to as "Little Detroit". This nickname comes from Dayton's prominence as a Midwestern manufacturing center. According to the United States Census Bureau, the city has a total area of 56.50 square miles (146.33 km2), of which 55.65 square miles (144.13 km2) is land and 0.85 square miles (2.20 km2) is water. At the airport, monthly mean temperatures range from 27.5 °F (−2.5 °C) in January to 74.1 °F (23.4 °C) in July. The highest temperature ever recorded in Dayton was 108 °F (42 °C) on July 22, 1901, and the coldest was −28 °F (−33 °C) on February 13, 1899. On average, there are 14 days of 90 °F (32 °C)+ highs and 4.5 nights of sub-0 °F (−18 °C) lows annually. Snow is moderate, with a normal seasonal accumulation of 23.3 in (59 cm), usually occurring from November to March, occasionally April, and rarely October. Precipitation averages 41.1 inches (1,040 mm) annually, with total rainfall peaking in May. Dayton is subject to severe weather typical of the Midwestern United States. Tornadoes are possible from the spring to the fall. Floods, blizzards, and severe thunderstorms can also occur from time to time. Dayton's population declined significantly from a peak of 262,332 residents in 1960 to only 141,527 in 2010. This was in part due to the slowdown of the region's manufacturing and the growth of Dayton's affluent suburbs including Oakwood, Englewood, Beavercreek, Springboro, Miamisburg, Kettering, and Centerville. The city's most populous ethnic group, white, declined from 78.1% in 1960 to 51.7% by 2010. However, recent census estimates show a 1.3% population increase since 2010, the first increase in five decades. As of the 2010 census, there were 141,527 people, 58,404 households, and 31,064 families residing in the city. The population density was 2,543.2 inhabitants per square mile (981.9/km2). There were 74,065 housing units at an average density of 1,330.9 per square mile (513.9/km2). The racial makeup of the city was 51.7% White, 42.9% African American, 0.3% Native American, 0.9% Asian, 1.3% from other races, and 2.9% from two or more races. Hispanic or Latino of any race were 3.0% of the population. The 2013 census population estimate showed an increasing City of Dayton population for the first time in five decades attributed to revitalization efforts downtown and the increasing downtown population. However, the 2014 population estimate indicates a net decrease of 897 individuals from 2013's estimate. Unlike many Midwestern cities its age, Dayton has very broad and straight downtown streets (generally two or three full lanes in each direction) that improved access to the downtown even after the automobile became popular. The main reason for the broad streets was that Dayton was a marketing and shipping center from its beginning: streets were broad to enable wagons drawn by teams of three to four pairs of oxen to turn around. In addition, some of today's streets were once barge canals flanked by draw-paths. A courthouse building was built in downtown Dayton in 1888 to supplement Dayton's original Neoclassical courthouse, which still stands. This second, "new" courthouse has since been replaced with new facilities as well as a park. The Old Court House has been a favored political campaign stop. On September 17, 1859, future president Abraham Lincoln delivered an address on the building's steps. Eight other presidents have visited the courthouse, either as presidents or during presidential campaigns. They include Andrew Johnson, James Garfield, John F. Kennedy, Lyndon B. Johnson, Richard Nixon, Gerald Ford, Ronald Reagan, and Bill Clinton. 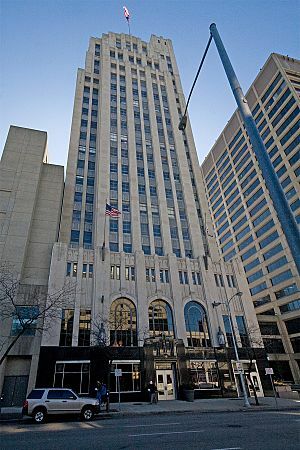 The Dayton skyline's two tallest buildings are the Kettering Tower at 408 ft (124 m) and the KeyBank Tower at 385 ft (117 m). Kettering Tower was originally Winters Tower, the headquarters of Winters Bank. The building was renamed after Virginia Kettering when Winters was merged into BankOne. KeyBank Tower was known as the MeadWestvaco Tower before KeyBank gained naming rights to the building in 2008. Ted Rall said over the last five decades Dayton has been demolishing some of its architecturally significant buildings to reduce the city's rental vacancy rate and thus increase the occupancy rate. The Benjamin and Marian Schuster Performing Arts Center in downtown Dayton is a world-class performing arts center and the home venue of the Dayton Philharmonic Orchestra, Dayton Opera, and the Dayton Ballet. In addition to Philharmonic and Opera performances, the Schuster Center hosts concerts, lectures, and traveling Broadway shows, and is a popular spot for weddings and other events. The historic Victoria Theatre, located in downtown Dayton, hosts concerts, traveling Broadway shows, ballet, a summertime classic film series, and more. The Loft Theatre, also located downtown, is the home of the Human Race Theatre Company. The Dayton Playhouse, in West Dayton, is the site of numerous plays and theatrical productions. Between 1957 and 1995, the Kenley Players presented live theater productions in Dayton. In 2013, John Kenley was inducted into the Dayton Theatre Hall of Fame. The Dayton Contemporary Dance Company (established in 1968) which hosts the largest repertory of African-American-based contemporary dance in the world. The company travels nationally and internationally and has been recognized by critics worldwide. The city's fine dining restaurants include The Pine Club, a nationally known steakhouse. Dayton is home to a variety of pizza chains that have become woven into local culture, the most notable of which are Cassano's, Marion's Piazza, and Flying Pizza. Notable Dayton-based restaurant chains include Hot Head Burritos, Super Subby's, Submarine House, and Fricker's. In addition to restaurants, the city is also home to Esther Price Candies, a candy and chocolate company, and Mike-sells, the oldest potato chip company in the United States. Many major religions are represented in Dayton. 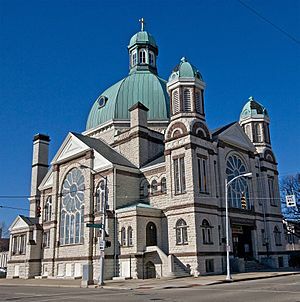 Christianity is represented in Dayton by dozens of denominations and their respective churches. Notable Dayton churches include the First Lutheran Church, Sacred Heart Church, and Ginghamsburg Church. Dayton's Muslim community is largely represented by the Islamic Society of Greater Dayton (ISGD), a Muslim community that includes a mosque on Josie Street. Dayton is also home to the United Theological Seminary, one of 13 seminaries affiliated with the United Methodist Church. Judaism is represented by Temple Israel. Hinduism is represented by the Hindu Temple of Dayton. Other museums also play significant roles in the tourism and economy of the Dayton area. The Dayton Art Institute, a museum of fine arts, owns collections containing more than 20,000 objects spanning 5,000 years of art and archaeological history. The Dayton Art Institute was rated one of the top 10 best art museums in the United States for children. The Boonshoft Museum of Discovery is a local children's museum of science with numerous exhibits, one of which includes an indoor zoo with nearly 100 different animals. There are also some notable historical museums in the region. The Dayton Aviation Heritage National Historical Park, operated by the National Park Service, commemorates the lives and achievements of Dayton natives Orville and Wilbur Wright and Paul Laurence Dunbar. The Wright brothers' famous Wright Flyer III aircraft is housed in a museum at Carillon Historical Park. Dayton is also home to America's Packard Museum, which contains many restored historical Packard vehicles. SunWatch Indian Village/Archaeological Park, a partially reconstructed 12th-century prehistoric American Indian village, is located on the south end of Dayton; it is organized around a central plaza dominated by wood posts forming an astronomical calendar. The park includes a museum where visitors can learn about the Indian history of the Miami Valley. The Vectren Dayton Air Show is an annual air show that takes place at the Dayton International Airport. 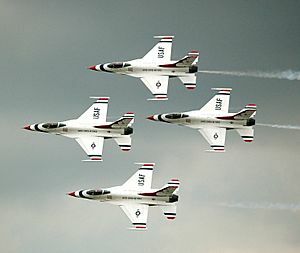 The Vectren Dayton Airshow is one of the largest air shows in the United States. The Dayton area is served by Five Rivers MetroParks, encompassing 14,161 acres (5,731 ha) over 23 facilities for year-round recreation, education, and conservation. 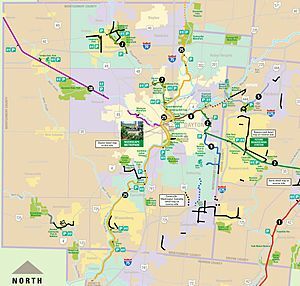 In cooperation with the Miami Conservancy District, the MetroParks maintains over 70 mi (113 km) miles of paved, multi-use scenic trails that connect Montgomery County with Greene, Miami, Warren, and Butler Counties. From 1996 to 1998, Dayton hosted the National Folk Festival. Since then, the annual Cityfolk Festival has continued to bring the best in folk, ethnic, and world music and arts to Dayton. The Five Rivers MetroParks also owns and operates the PNC Second Street Market located near downtown Dayton. The Market has more than 50 vendors selling items such as produce, cooked foods, baked goods, crafts, and flowers. The Dayton area is home to several minor league and semi pro teams, as well as NCAA Division I sports programs. The Gem City Rollergirls flat track roller derby league is the first (and only) WFTDA league in Dayton, Ohio. The team was established in 2006, and began a rapid climb in the national ranks in 2015. At present, the league hosts double-header bouts at Hara Arena, playing their A-Team (The Purple Reign) and their B-Team (The Violet Femmes) against visiting teams. The league is skater-owned and skater-run. The Dayton Gems was a minor league ice hockey team in the International Hockey League from 1964 to 1977, 1979–1980, and most recently 2009 to 2012. The Dayton Bombers were an ECHL ice hockey team that most recently played the North Division of the ECHL's American Conference. In June 2009, it was announced the Bombers would turn in their membership back to the league. However, hockey remained in Dayton as the Dayton Gems of the International Hockey League we reformed in the fall of 2009 at Hara Arena. The Gems folded after the 2011–12 season. Shortly after the Gems folded, it was announced a new team, the Dayton Demonz, would begin play in 2012 in the Federal Hockey League (FHL). The Demonz folded in 2015 would be immediately replaced by the Dayton Demolition, also in the FHL. However, the Demolition would cease operations after only one season when Hara Arena decided to close due to financial difficulties. Dayton hosted the first American Professional Football Association game (precursor to the NFL). The game was played at Triangle Park between the Dayton Triangles and the Columbus Panhandles on October 3, 1920, and is considered one of the first professional football games ever played. Football teams in the Dayton area include the Dayton Flyers and the Dayton Sharks. The Dayton region is also known for the many golf courses and clubs that it hosts. The Miami Valley Golf Club, Moraine Country Club, NCR Country Club, and the Pipestone Golf Course are some of the more notable courses. In addition, several PGA Championships have been held at area golf courses. The Miami Valley Golf Club hosted the 1957 PGA Championship, the Moraine Country Club hosted the 1945 PGA Championship, and the NCR Country club hosted the 1969 PGA Championship.Additionally, NCR CC hosted the 1986 U.S. Women's Open and the 2005 U.S. Senior Open. Other notable courses include the Yankee Trace Golf Club, the Beavercreek Golf Club, Dayton Meadowbrook Country Club, Sycamore Creek Country Club, Heatherwoode Golf Club, Community Golf Course, and Kitty Hawk Golf Course. The Greater Dayton Regional Transit Authority (RTA) operates public bus routes in the Dayton metro area. In addition to routes covered by traditional diesel-powered buses, RTA has a number of electric trolley bus routes. The Dayton trolleybus system is the second longest-running of the six remaining trolleybus systems in the U.S., having entered service in 1933. It is the present manifestation of an electric transit service that has operated continuously in Dayton since 1888. Dayton operates a Greyhound Station which provides inter-city bus transportation to and from Dayton. The hub is in the Greater Dayton Regional Transit Authority North-West hub in Trotwood. Air transportation is available just north of Dayton proper, via Dayton International Airport in Vandalia, OH. The airport operates 24 hours a day, seven days a week, and offers service to 21 markets through 10 airlines. In 2008, it served 2.9 million passengers. The Dayton International Airport is also a significant regional air freight hub hosting FedEx Express, UPS Airlines, United States Postal Service, and major commercial freight carriers. Interstate 75 runs north to south through the city of Dayton and many of Dayton's north and south suburbs. US 35 is a major east-west highway that is most widely used between Drexel and Xenia. State Route 4 is a freeway that is most heavily traveled between I-75 and I-70. State Route 444 is north-south state highway. Its southern terminus is at its interchange with Route 4 and its northern terminus is at Interstate 675. This limited-access road serves Dayton and Fairborn and is a significant route to access points serving Wright-Patterson Air Force Base. In cooperation with the Miami Conservancy District, Five Rivers MetroParks maintains over 70 mi (113 km) miles of paved scenic trails for cycling and other activities. In 2010, the city of Troy was named "bike friendly" by the League of American Bicyclists, who gave the city the organization's bronze designation. The honorable mention made Dayton one of only two cities in Ohio to receive the award, the other being Columbus, and one of only 15 cities nationwide. Kettering Tower, Downtown Dayton's tallest high-rise. 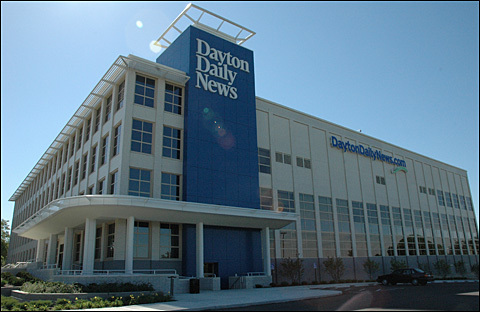 Dayton Daily News building at 1611 S. Main St.
Dayton, Ohio Facts for Kids. Kiddle Encyclopedia.